So Easter is just around the corner, not to mention spring break is here, and I've been on the lookout for some cute crafts to do with the girls. I found an adorable idea from Jeromina over at her blog that we really wanted to try. These little chicks just melted my heart, how sweet! 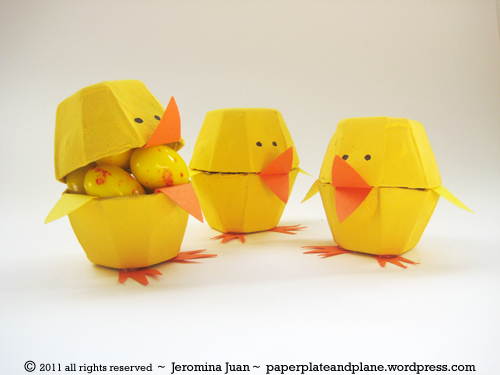 Next, you want to cut up the egg carton so you get a pile of little cups you will use to make your chicks. I was saddened to find out our egg cartons were not as symmetrical or smooth as they were in the sample picture. They were lumpy and bumpy in places. It's also good to note that it was too hard for the little ones to cut, so I'd save this part for an adult or older child. Oh and also, I would do this WAY before you call people to craft, as it takes a few minutes and they start to impatiently swarm you as you cut frantically. So, do some adult prep-time here and save some whine time. Next you want to take two egg cup halves and use a strip of duct tape to secure them together.This will make a nice hinge for the chick to open it's mouth. Also when you paint in a few, you will paint over this and it will all turn into the same color. Next comes the fun part: PAINTING Start with painting the inside of the cups first Then open up gently from the hinge and paint the outside. There really was no way around it, you really had to touch the paint at times to hold these down, they are very fragile. My youngest got pretty good at holding it down gently while she was painting, and she's only four. I don't know exactly why it is, but I absolutely LOVE a paint pallet full of wonderful colors. Then we let them dry over night (you could probably let them dry for a few hours if you have less time), I was working on a toddler attention span, so we only craft when the moment is right. These totally reminded me of coloring Easter eggs, they were all so bright and cheery looking. While these are drying, you will have time to cut out the beaks, wings, (there were feet too, but we opted out of those). 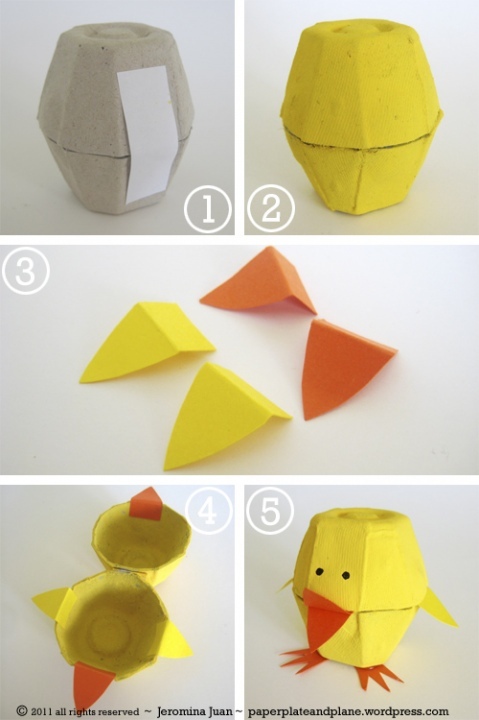 The picture from Jeromina shows the shapes to cut out best, and how to place them using tape. Also looking back after the fact, if you have glue dots, they would work a LOT better at attaching the extras, the tape after a while started to pull off. After that we finished up our little chicks. I had some craft feathers lying around so we added them to the tops of their heads. They looked pretty cute all sitting together with their rainbow hues. We had fun doing these, they were tiny, fragile, time consuming, but the girls got some time to do some art together and make something pretty. I'd say their favorite part was actually the painting. Also I think older kids with a bit more manual dexterity (like 8+) would have a blast customizing these. Have a great rest of the week and a wonderful Easter ahead. SO ADORABLE...YOU ARE INDEED CLEAVER MY DAUGHTER!!! OUR SWEET GRANDAUGHTERS ARE BLESSED WITH SUCH AN AMAZING MOM!